There are plenty of absurdities one can point to and laugh at, and more one can deride with horror, about the Trump-Kim summit on June 12th. The extraordinary spectacle of Trump going from threatening “fire and fury” and boasting about the size of his nuclear button, to praising “Little Rocket Man” as “very talented”, and admiring the way he was able to assume his father’s mantle of ruthless dictator with such aplomb at the tender age of 26. There is the absurd video “trailer” the National Security Council prepared for the North Koreans. There is Trump’s highly distasteful tweets about how much Kim “loves his country” and how his people love him, despite presiding over a regime that has starved many of them to death, and holds hundreds of thousands of them in gulags. In general, the picture of Trump and Kim shaking hands like best buddies, praising each other, Dennis Rodman crying tears of joy while wearing a MAGA hat, is bewildering, overturning everyone’s assumptions about who is a ‘hawk’ or a ‘dove’. As I quipped on Facebook, we may be living in the dark est possible timeline, but also the weirdest. 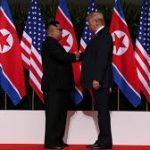 For all the pundits’ chatter over who ‘won’ the summit, however, surely the more important question is whether the summit has made the world a safer or a less safe place, or has made essentially no difference. It has been widely pointed out by foreign policy commentators of all stripes that the agreement, of less than 400 words, between Trump and Kim, essentially says nothing. It talks of a promise of peace and security guarantees, but without specifics. It talks of a process leading to “denuclearization” of the Korean peninsula, without any idea of what that means: unilateral North Korean disarmament and dismantling of their nuclear program and capabilities, or a more gradual process where North Korean disarmament is accompanied by the removal of US nuclear assets from the Korean peninsula and surrounding region, the removal of the US nuclear umbrella from South Korea and Japan, and possibly a reduction or withdrawal of US troops from South Korea. There is no talk of verification, of irreversible disarmament, or indeed of anything specific. We have been here before, critics say, where North Korea makes vague general promises, seeks to gain economic and diplomatic benefits, and ultimately does nothing of significance. (Although the US has also failed to follow through on previous agreements). 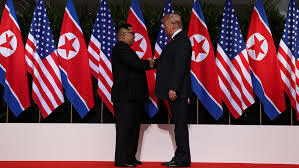 Some commentators have also criticized the way Trump has already made concessions, such as suspending military exercises with South Korea, without getting anything in return; that the summit, overall, is a diplomatic triumph for Kim who has achieved North Korea’s long-standing goal as being seen and dealt with by the US on equal terms. This is all very true, and there is absolutely no guarantee that anything substantive will come of this. However, I am inclined to see a certain amount of positive in these bizarre happenings. First of all, the fact that the US and North Korea are, for the moment, talking about peace and about talking, rather than about war, is a very good thing. The threats and hyperbole Trump and Kim were throwing around; and even the more guarded language, but equally threatening posture, taken by previous US Administrations, always carried the risk of events spiraling out of control through miscalculation and misunderstanding, triggered perhaps by an isolated military incident. How long this will last is unclear, but for now the tensions and the rhetoric are dialed down, and with it the risk of war. Talks may go nowhere, but so long as they are happening, war is less likely. North Korea, despite threats, sanctions, and whatever else, continues its nuclear program and develops usable nuclear weapons that are capable of reaching the US. A tense, uneasy cold war persists, where the possibility of nuclear war is always there, but highly unlikely at any given moment, due to the unthinkable destruction it would cause to all sides. A substantive deal is achieved whereby North Korea abandons its nuclear program, in return for whatever combination of security guarantees, actual reduction of US forces/relaxation of posture, and economic benefits, the US offers in return. Possibly accompanied by a full peace treaty ending the Korean War of 1950-53. The US goes to war either to prevent North Korea obtaining a usable nuclear capability, or to preemptively destroy one that has already been created. This could be a conventional war, if it is conducted early enough, but still enormously destructive and with unknown potential for chaos and further conflict with China in the aftermath, or nuclear war, if North Korea manages to use some of its weapons, or if China gets involve and things escalate to nuclear weapons. In my view, option 2) is clearly the best, and option 3) the worst. Some hawkish commentators and politicians—like, in the past, National Security Advisor John Bolton—prefer 3) to 1), arguing that North Korean unpredictability and irrationality make it preferable to act early, accept the damage caused by conventional war, and remove the possibility that North Korea could ever acquire and use nuclear weapons. I disagree. North Korea is an extremely brutal and unpleasant regime, it has found itself in a pariah status in the international system, and it engages in blood-curdling rhetoric as part of its strategy, but, as many commentators have pointed out, it is not irrational, but rather consistently pursues a goal of regime survival, which any form of war with the US would destroy. I am not happy about North Korea having nuclear weapons; I am not happy about any country having nuclear weapons. Any country possessing nuclear weapons carries with it a risk that they will, by accident, miscalculation, or design, be used. But I regard the risk of this additional player in the game of Mutually Assured Destruction to be less than the certain horror that would be involved in a war between the US and North Korea, not to mention the risk that such a war could bring in China, with a far more formidable nuclear arsenal than North Korea. (Plenty of commentators have discussed just how destructive even a conventional war between the US and North Korea would be. See for example this Vox article from February.). I am not greatly optimistic that the summit, and whatever process of negotiations follows, will lead to the ideal outcome, option 2) and peace. At any rate, there is a possibility that it might, which did not exist before the summit. What seems certainly to be the case is that option 1), uneasy armed peace, has become more likely, as opposed to option 3), hot war. There is a danger that, if North Korea does not offer any meaningful steps towards disarmament and negotiations appear to be going nowhere, that the US (and Trump) will be left with a loss of face and nowhere peaceful to go. However, the longer negotiations go on, the more difficult it will be for the US to take the decision to try to destroy North Korea’s nuclear arsenal preemptively. I do not trust Trump to handle this process well, and it could yet all unravel if he feels slighted one morning. (Like he did when he abruptly cancelled the summit, before deciding he felt better a few days later). Trump’s unpredictability is, until 2020 or something really indisputable from Mueller, a given. But I’d rather have him handling peace talks badly than hurling threats of war, threats he might just carry out.